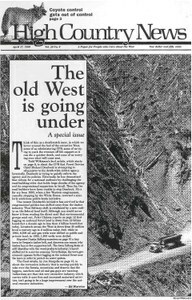 An HCN special issue says that the old extractive West is on its deathbed. An introduction to HCN's special issue says that the old extractive West is on its deathbed. The small timber town of Detroit, Ore., turns its back on its logging history to protect its watershed from clear-cutting. The General Accounting Office once again takes the Forest Service to task for inefficiency and waste. The American Recreation Coalition, which lobbies for motorized recreation, has become a potent force in the nation's capital as outdoor recreation becomes the dominant natural resource industry, especially in the West. Grand Forks Herald wins Pulitzer; Southwest Center edits HCN story; Writers on the Range; visitors; adieu to San Juan Almanac. A plan by the Animal Damage Control Agency (recently renamed Wildlife Services) would allow coyotes to be shot from helicopters, even if the animals are not bothering livestock. SUWA's new slogan: "Protect Wild Utah"; Ray and Ron Pene may not mine Westwater Canyon; Wayne Hage sues federal gov't. ; Louisiana-Pacific's Dana Dulohery gets five months' jail; Wyo. 's South Pass listed by World Monument Fund as endangered. Some mills in Oregon stay busy even as fewer trees are cut in the U.S. by milling imported logs. Because of a mapping error, the Boise National Forest allows logging in the Snowbank Roadless Area near Cascade, Idaho. Oregon Gov. John Kitzhaber, in an attempt to protect salmon while keeping them off the endangered list, runs into problems when the National Marine Fisheries Service seeks stricter standards. The 21st International Wildlife Film Festival in Missoula, Mont., tries to showcase wildlife films that are based on good science and do not distort or exploit wildlife. Does Suckling know where he is?